I just love the combination of leather and lace don't you? It mixes the delicate feminity of lace with the edgy rugged look of leather!!! I love the partnership of these two fabrics!! 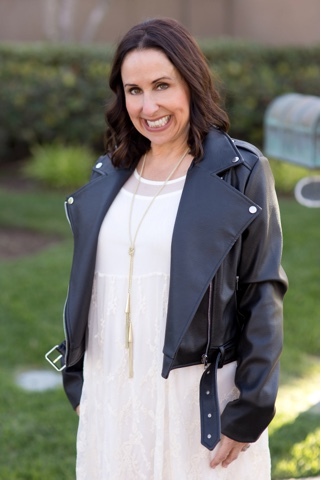 So I decided to style this adorable lace dress from a cute boutique Jasper Plum, with this Moto faux leather jacket from Misgiuded that I picked up at the Nordstrom Fashion show that I (you could read about here). I added a great Kendra Scott necklace and my fave Jeffrey Cambell lace ups to complete this look. What do you think about combining leather and lace? I would love to hear about it!! Thanks to Gabi Wells for photos and happy reading!!! !